"IN THE HEART OF THE HIBERNIAN METROPOLIS (U7.1)"
The 'Aeolus' episode is set in the offices of the Freeman's Journal, located on Prince street, just behind the Hotel Metropole on Sackville street. 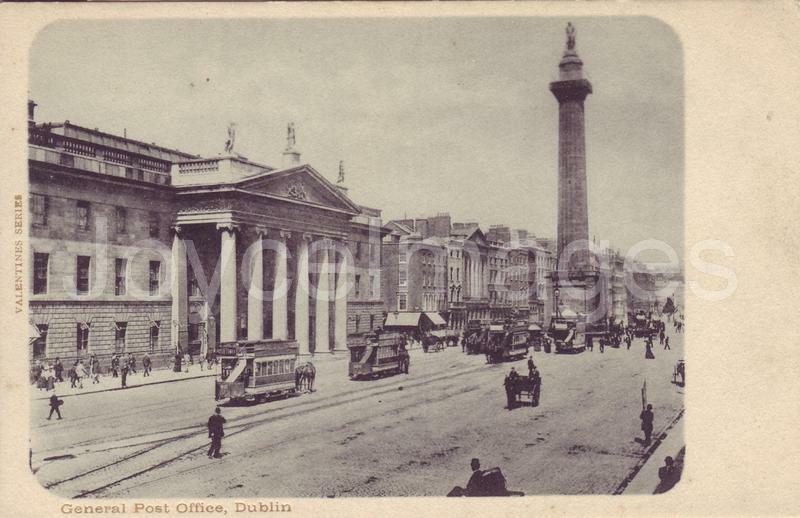 We see on this PC, as the legend indicates, Nelson's pillar, the General Post Office (GPO), and Hotel Metropole; also the statue of Sir John Gray in the foreground. Photographs of the offices and printing of the Freeman's Journal are exceedingly scarce. The images I use to illustrate the making of a newspaper in this episode are mostly contemporary photographs from the French daily 'Le Petit Journal'. 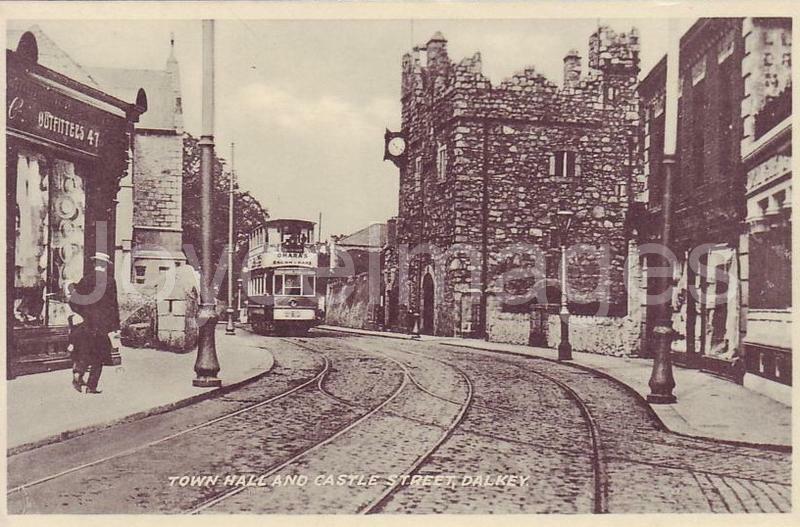 On May 16th 1896, Dublin's first electric trams began running between Haddington Rd and Dalkey. 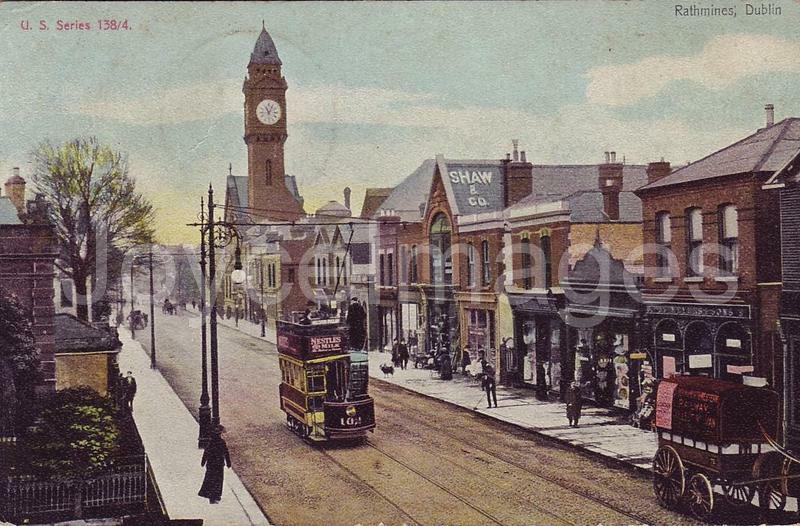 Initially operated by the Dublin Southern District Tramways Company, the line was sold a few months later to the Dublin United Tramways, at that time running about 170 horse cars over 33 route miles. 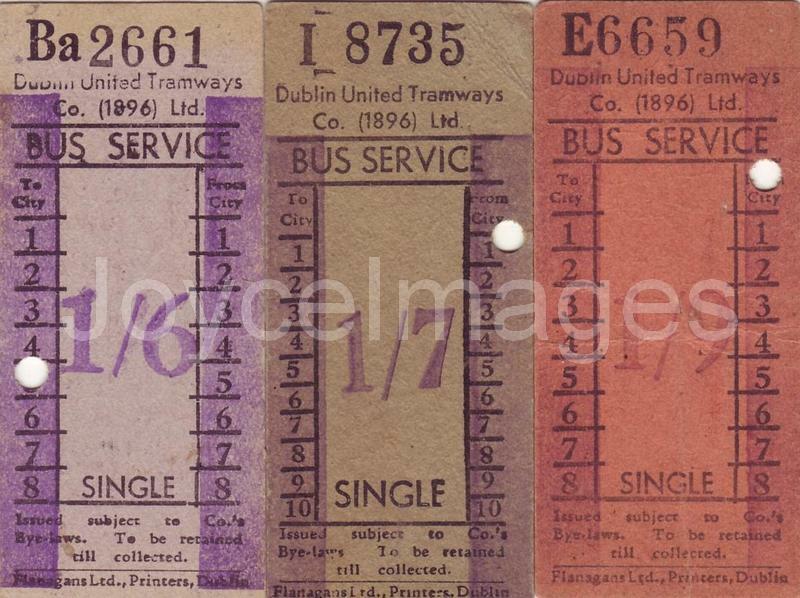 The merger, now renamed Dublin United Tramways Company Ltd. (DUTC, 1896), immediately set about total electrification. This was completed in 4 years. 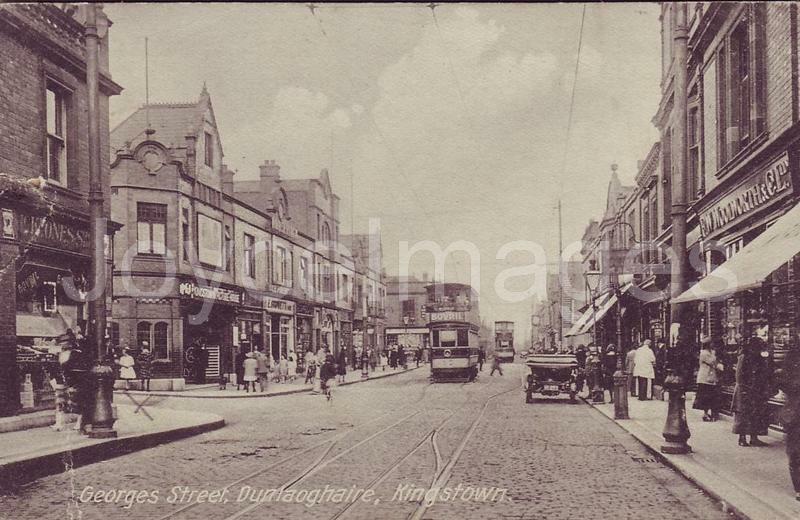 Over the next decade, the Dublin tram system became a world leader, pioneering several developments that were later adopted universally. 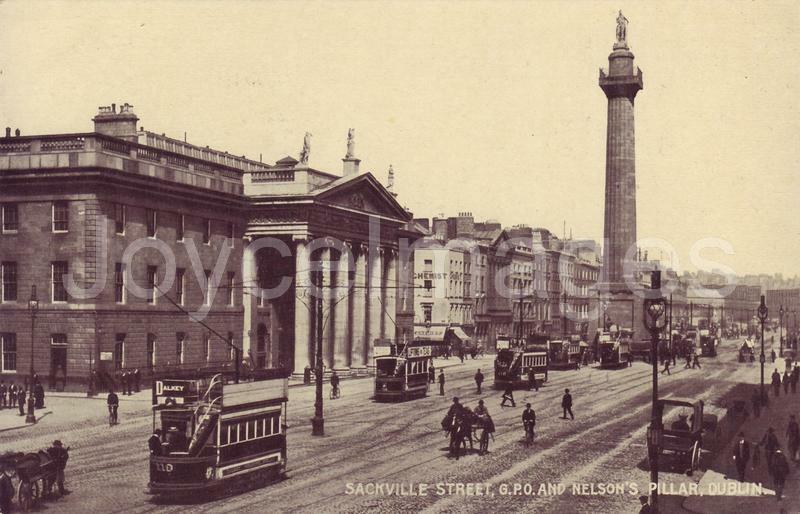 Nelson's pillar was one of the main tram terminals. 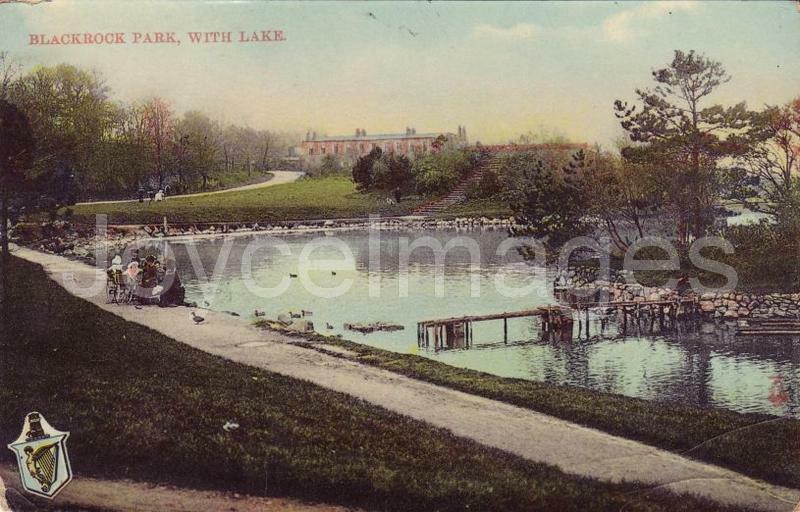 - Come on, Sandymount Green! 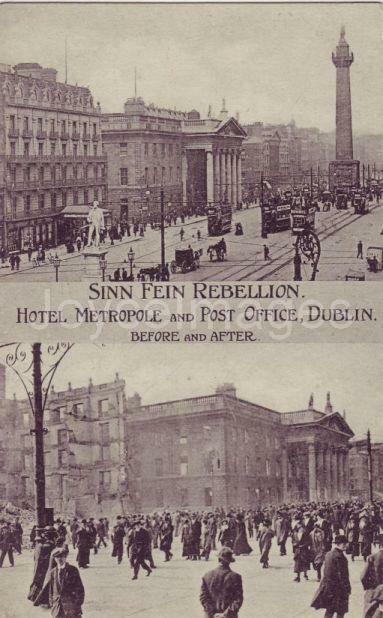 Opened in 1818, the general post office (GPO) on Sackville Street is one of the most important landmarks in the city. 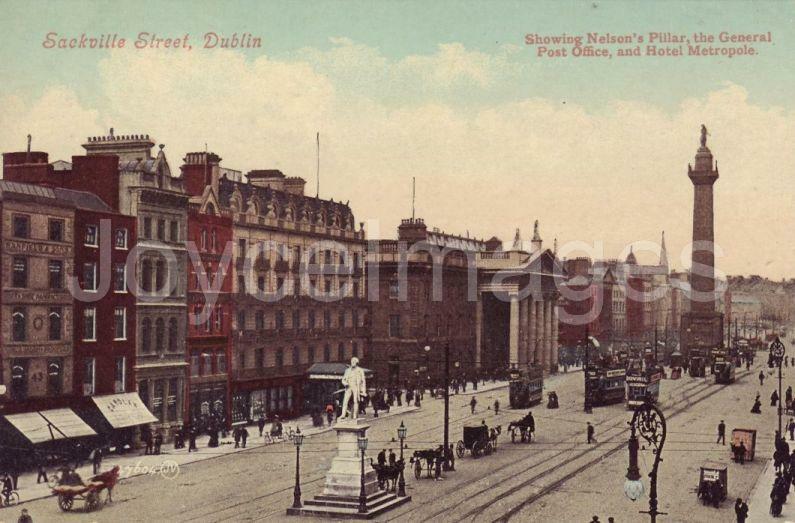 Distances from Dublin are measured from the GPO. 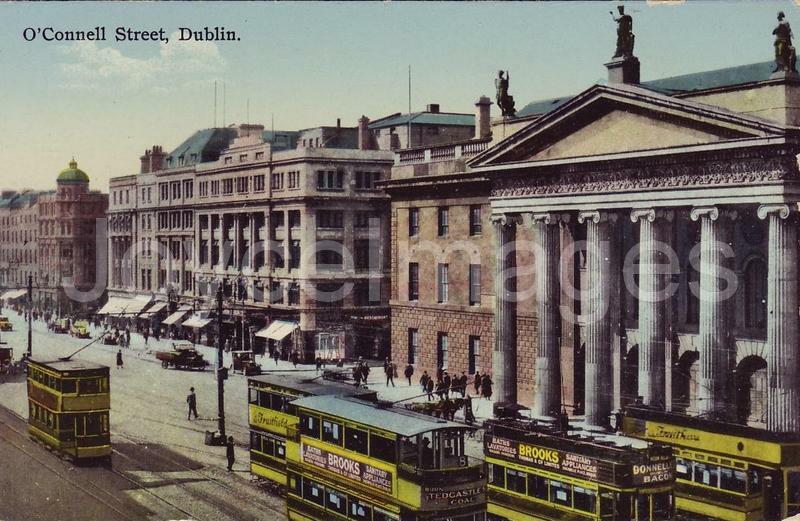 From 'Dublin' (SOF, 1907): "The GPO building, of 3 stories, the lowest rusticated, is of mountain granite. 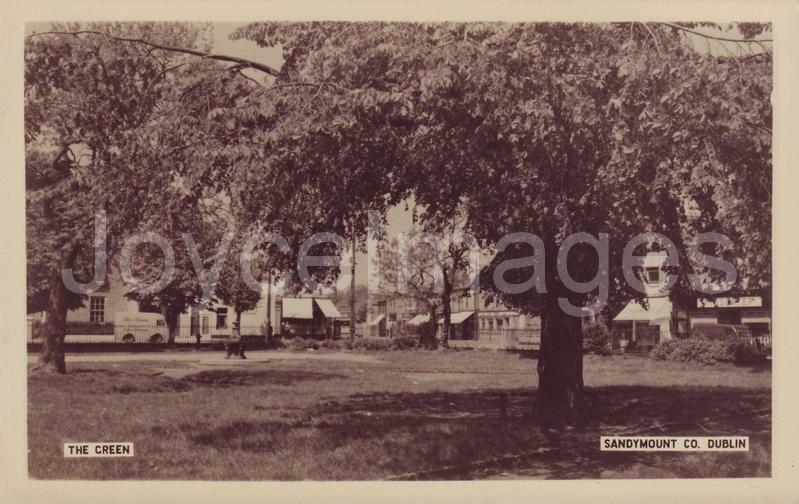 The frontage is 223 feet. The magnificent portico, 80 feet in width, consists of 6 fluted ionic columns, each 4 feet 6 inches in diameter. These support an entablature with a richly carved frieze and a pediment, the tympanum of which bears the Royal Arms. Surmounting the pediment are statues, by John Smyth, of Mercury with the caduceus and purse; Fidelity finger on lip and bearing a key, and in the centre Hibernia with shield and spear. The cornice, 50 feet above ground-level, supports a handsome balustrade. 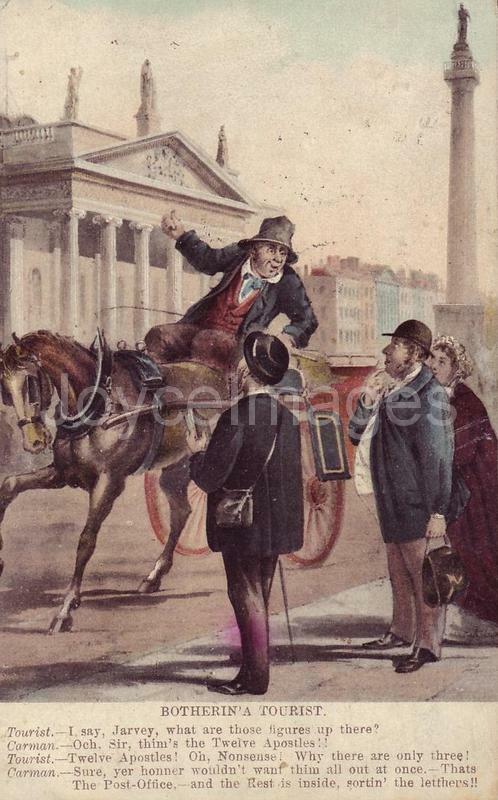 From the court-yard of this building the mail-coaches once spead nightly, north and south, east and west; the English mail leaving at 7am by cart for Howth, whence the steam packets, or, in stress of weather, wherries, took it to Holyhead." 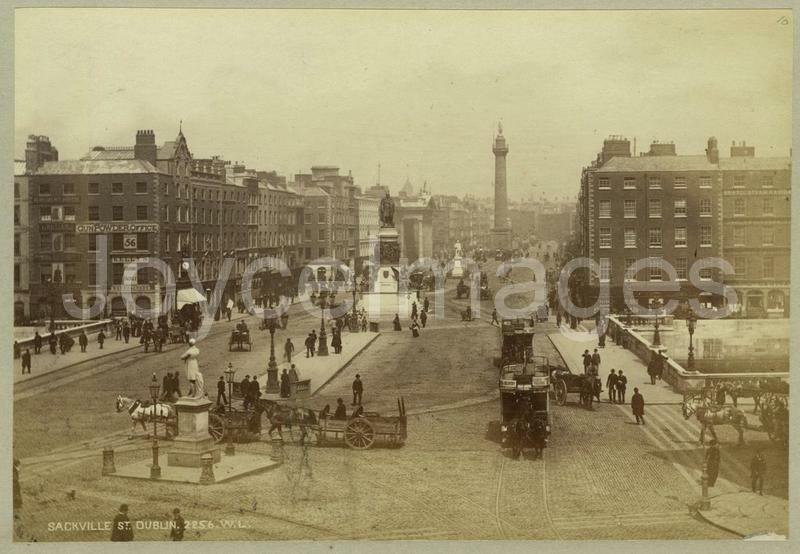 This PC shows a popular Dublin joke, at the expense of British 'tourists,' about the statues atop the GPO. 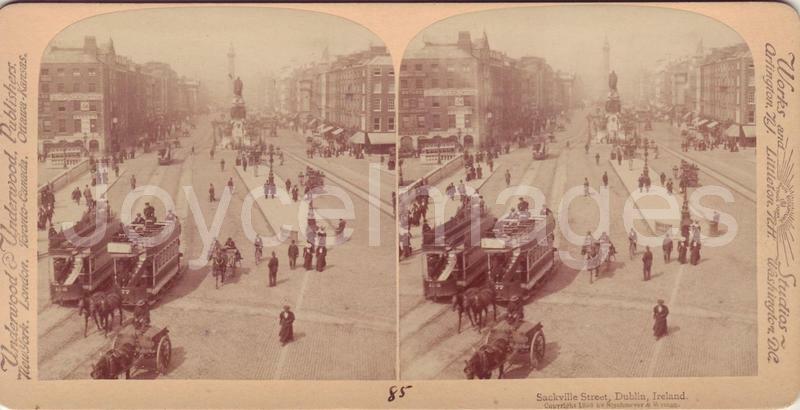 The same view of Sackville street Before and After the 1916 rebellion. 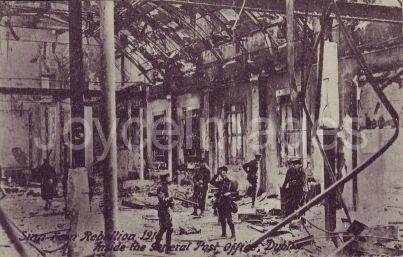 The Metropole hotel was totally destroyed during the events.